A lot of products on the market for dogs health and a lot of skeptical brands and products however Bullyade is hands down one of my favorite products on the market. I use bullyade for my puppies to keep them hydrated and full of vitamins to aid in the growth process as well as my pregnant and welping females to fill them with electrolytes and keep them filled with nutrients to aid the process in feeding pups and keeping the female healthy. My grown dogs I supplement into there everyday feeding schedules to keep them at tip top shape. Not many products on the market compare and show the results that bullyade does. 100% recommend this product for anyone. Here at 4 point family K9’s, we strive to find the best for our dogs. The search was relentless until we found bullyade, our dogs love it, keeps them healthy not just hydrated. We even put in on their food dry. Thanx so much for this amazing product! My dogs LOVE Bullyade!! 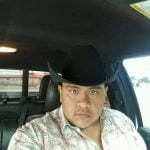 Out here in Texas it gets HOT! I always have some Bullyade waiting for them after our walks. They love it! I show my dogs love by giving them the best, BULLYADE helps to make that happen. Great product, they love it. We have used Bullyade ever since our dogs arrived to our home. Its one of the Best Supplements their is. Our pups stay hydrated at all times and their coats are looking amazing. How Vitamins and Electrolytes For Dogs Can Help Bullyade protects your dog & helps them recovery fast! The canine parvovirus (CPV) infection is a highly contagious viral illness that affects dogs. The virus can demonstrate itself in two distinct forms in your sick dog. The intestinal form of this infection is common in dogs and includes the symptoms of bloody diarrhea, vomiting, weight loss and decreased appetite of the sick dog. Bullayde serves as the perfect parvo recovery supplement. Bullyade is one of the most spectacular dog supplements that will provide your beloved pet an absorbable vitamin that will not only protect your dog from organ failure but will also help it defeat the virus. This makes bullyade a very easy solution for quick and easy Parvo treatment and one of the most easily accessible parvo recovery supplement out there! It is common for dogs to get dehydrated; be it simply because of the weather, heat strokes or other medical reasons like diarrhea. This dehydration not only makes your pet lethargic and sick but could also lead to more disastrous consequences that could cost your pet its life. A dehydrated dog doesn’t just lose water, its body also loses electrolytes and vitamins. Bullyade can ensure that your dog regains the lost water and will provide your canine with all the needed electrolytes for dogs, thereby assisting your pet to be at the best of its health! 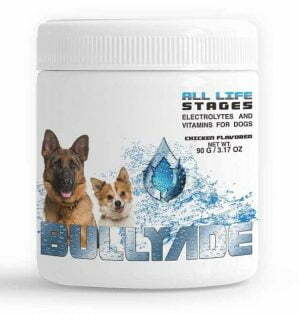 Bullyade contains a total of 18 vitamins and minerals that have been designed specifically for canines. All the ingredients in these vitamins for dogs help your pet bounce back to health faster than ever. The best part of bullyade is that it has no age limit! You can easily trust bullyade as a source of minerals and vitamins for dogs, no matter what the age of your pet is. Recommended by vets all across the globe, bullyade helps older dogs enjoy a long and healthy life. To ensure that you are able to provide the best dog supplements to your pet dog, special care is given to the making of Bullyade. It is manufactured in the United States in a facility approved by the FDA. The manufacturer of Bullyade is GMP (Good manufacturing practice) Certified, meaning we ensure that we provide only the best dog supplements that could provide your canine with only the very best. We know your dog is your best friend and you love him. Wouldn’t it be nice to provide him with something that puts a good flavor to its water and makes it tasty? Our special formula of providing the much needed electrolytes for dogs comes in delicious Chicken and Beef flavors. If you’re a dog lover who likes feeding healthy treats to your pet, Bullyade is the perfect choice for you. You can easily mix Bullyade in their food, water or treats, making their meal healthier and more enjoyable. Bullyade can be a life saver for your pet and yet is very simple to use. With bullyade it is now easier than ever to give your dog a healthy life by ensuring the following. Rapid recovery from illnesses caused by viruses or disease. Safest way to provide nutrients to a dog that won’t eat or drink. Easy on the stomach | No more puppy throwing up after eating. Regulates the body temperature of your dog. Ensures that your pet receives the required nutrients for a healthy life. Faster recovery from dehydration or vitamin deficiency. Sprinkle Bullyade on your pets wet or dry dog food. Give them the additional vitamin boost designed specifically for them. Bullyade- Vitamins and Electrolytes for Dogs | Natural Dog Supplement. Bullyade Changes the Taste of What Your Dog Drinks Daily Your dog will surely be happy with the delicious flavor of bullyade infused in its drinking water! Did you know that when your puppy is sick, infected or is suffering from symptoms like Dog Vomiting, Loss of appetite, Dog Diarrhea, or blood in dog stool, dehydration is the number one cause of death? Bullyade can help avert the problem of dehydration by replacing lost fluids & electrolytes in your pet friend at a rate that is quicker than most of the traditional methods out there. Specifically in summers, dogs are at a very high risk of being exhausted from the hot weather due to dehydration and overheating. Electrolytes for dogs are extremely important to offer your pet a fast recovery. Be it the problem of the hot weather, of working breeds or short nose breeds or problems as simple as your dog not eating well or not being active, Bullayde can help you with all of it. We know ensuring the overall wellness of your dog is your priority and what better way to do it than with The Best Vitamin Supplement for dogs. It’s a great way to ensure a fast recovery and provide your pet with the overall health and wellness. 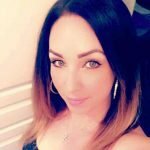 Why should I consider Bullyade? Bullyade Vitamins and Electrolytes for dogs is a solution designed to care for dogs of all breeds. Every ingredient in bullyade has been added with great consideration to help your dog at every stage of its growth. Bullyade is created and manufactured in the United States. Recovering from dehydration, assisting with the development of red blood cells and a quick and easy parvo treatment at home, bullyade is your solution to all these problems and many more. 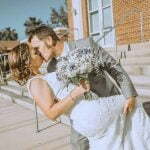 How will Bullyade help my dog? Bullyade is utilized to treat the problems of coccidea, diarrhea, dehydration, heat exhaustion, skin and coat problems, immune deficiency, digestive problems, calcium deficiency, and many more problems like your dog not eating adequately. Heading out to the beach for the day? Pack up a few water bottles with bullyade for them and take them along to make sure that your pet stays safe in the hot weather. 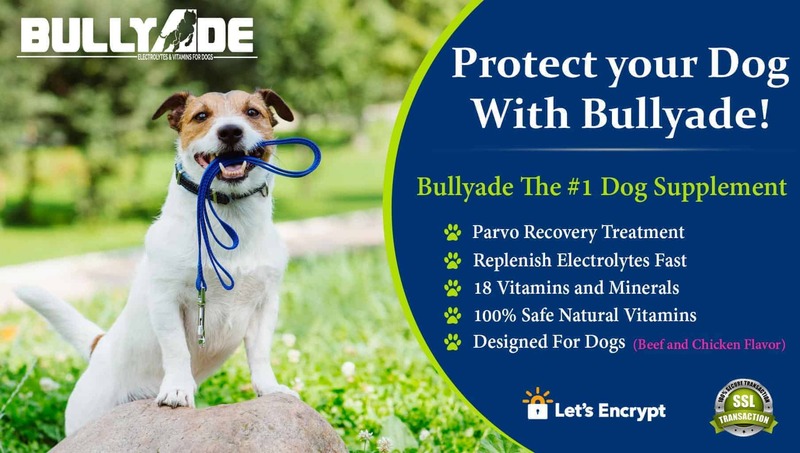 Bullyade is a complete Vitamin Supplement for dogs, particularly designed to replace electrolytes that your dogs lose when they are sick, exposed to elongated periods of hot weather, and when they suffer from a heat stroke. All breeds of all ages can benefit from bullyade, getting ample nutrients with a good taste, and that is what makes it so special. 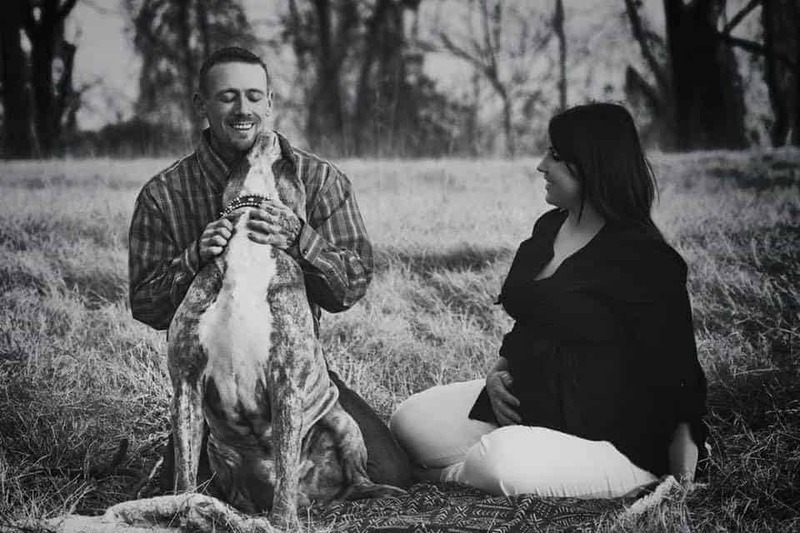 From ensuring quick parvo treatment at home to keeping it hydrated, Bullyade cares for your canine and so besides taking care of your dog’s health, it also provides sponsorship for amazing K9’s that are making their mark on the canine world. The Results of using bullyade will vary based on the individual needs of your dog. One thing that you will notice immediately after using bullyade is that your pet will instantly start recovering from dehydration. Packed with electrolytes and its pleasant taste, your dog will enjoy bullyade even when it is not too keen on eating or drinking anything else. You can read some of the study, published in open-access journal Frontiers in Veterinary Science which adequately explains how flavored electrolytes can and have helped many different breeds of dogs in the past and continue to do so. WHAT IF MY DOG WON'T DRINK BULLYADE? So, the Bullyade supplements you ordered have finally arrived and you are eager to let your dog have them so as to keep them fit and healthy. You’re relieved because your pet is going to have the best vitamin supplements available. But, what happens if Bingo does not like the new taste? Not all dogs will dive straight into a new pet product when it is introduced to them for the very first time. Relax, you don’t need to start examining the return policy on the delivery box or consider a refund. We have some great tips that will get your dog to want and enjoy every scoop of Bullyade you give him. Firstly, be patient with Your Furry Friend. Understand that your dog needs time to adjust to the new taste. You will have to be patient, Given that Dogs are picky about what they eat and drink. Give your canine some time to get familiar with the new taste. Initially it will walk away after taking a few slurps, and that is okay. Soon, he will get acquainted to the taste and will start drinking it normally. Mix Bullyade with other drinks or dog foods. Water isn’t the only liquid dogs like, they relish the taste of other liquids like carrot juice and broth too. Mix bullyade in other drinks and let Bingo happily slurp away at his bowl of soup filled with health ensuring electrolytes! You can also Mix bullyade with carrot juice and give your pooch potassium and fiber. One last benefit of bullyade; you can mix in any form of dog food to ensure they are receiving all the 18 multivitamins incorporated into Bullyade. Introduce your dog to Bullyade early. The earlier you introduce your dogs to Bullyade, the better it is for their health. When young puppies are being weaned from their mother’s milk, it is a great time to introduce them to this full of vitamins product. Mix Bullyade into the drinking water of the puppies and let them drink it to their fill. By the time they grow up, Bullyade will be their favorite flavor, be it mixed in water or other recipes you prepare for your pet! 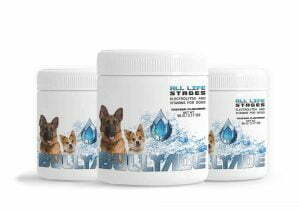 The Bullyade electrolytes for dogs are designed for all life stages. What if your dog grows tired of Bullyade Electrolytes for dogs? Your dog can get tired of Bullyade, specifically if you mix it in the drinking water all the time. However, you still cannot neglect the health of your dog. Give your dog normal water and then add the vitamin laden bullyade into his juices and broths. You can find some amazing Bullyade Recipes here. Your dog has a lot to gain from drinking Bullyade Vitamins & Electrolytes for dogs. Bullyade will aid your dog in staying fit and healthy. It will boost his immune system by increasing the vitamins A, C, D and E in his body to the required levels. Rich in important minerals like phosphorus and calcium, bullyade ensures the strong development of bones and joints in your dog. When your canine friend gets sick, be it through diarrhea or due to your dog not eating well, there’s a good chance that he is rapidly losing electrolytes and nutrients. With bullyade, your dog will be healthy and happy in no time! Your dog gets happier and healthier each time you choose to use Bullyade, and that is exactly what we want; Happiness and health of all our canine friends! 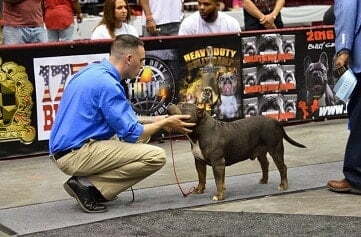 Champions Use Bullyade Vitamins & Electrolytes for dogs BOBBY HEUMANN uses Bullyade. Actor Dean Cain Endorses Bullyade! Click the picture to see his video. 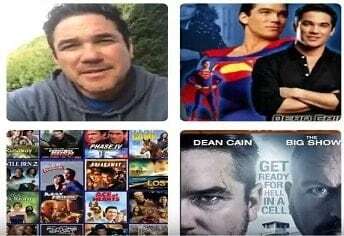 Dean Cain also known as Clark Kent/Superman in the TV series Lois & Clark: The New Adventures of Superman lets the world know they should pick up some Bullyade. 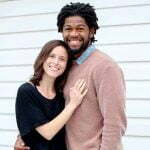 Everyday Dog Owners Use Bullyade Dale Walton Jr. and Jessica DeMarce. Best Parvo Treatment Product for dogs. I highly endorse Bullyade. Not only does it help my dog in the summer months, it’s also a great vitamin. My dogs all get up and go now more than ever!